On June 5, 2014 the Manitoba IBA team met with Dale Banman, Economic Development Officer with the Turtle Mountain Community Development Corporation, to visit Whitewater Lake on our first tour of a Manitoba Important Bird Area (IBA) of the season. Whitewater Lake is a moderately-saline, alkaline lake, located in southwestern Manitoba between the towns of Boissevain and Deloraine, just north of the Turtle Mountain Provincial Park. The site has been designated an IBA, primarily due to large populations of waterfowl and shorebirds, with the IBA trigger species being Snow Geese, White-rumped Sandpipers, Black-crowned Night-Herons, Franklin’s Gulls, and Mallards. The lake is also a Provincial Wildlife Management Area, which provides some protection to the area by regulating activities such as logging, hunting, mining, agriculture, and hydroelectric power generation. Our goals were to explore the IBA, learn as much about it as we could from our guide Dale, put up IBA signs, and maybe see a bird or two. 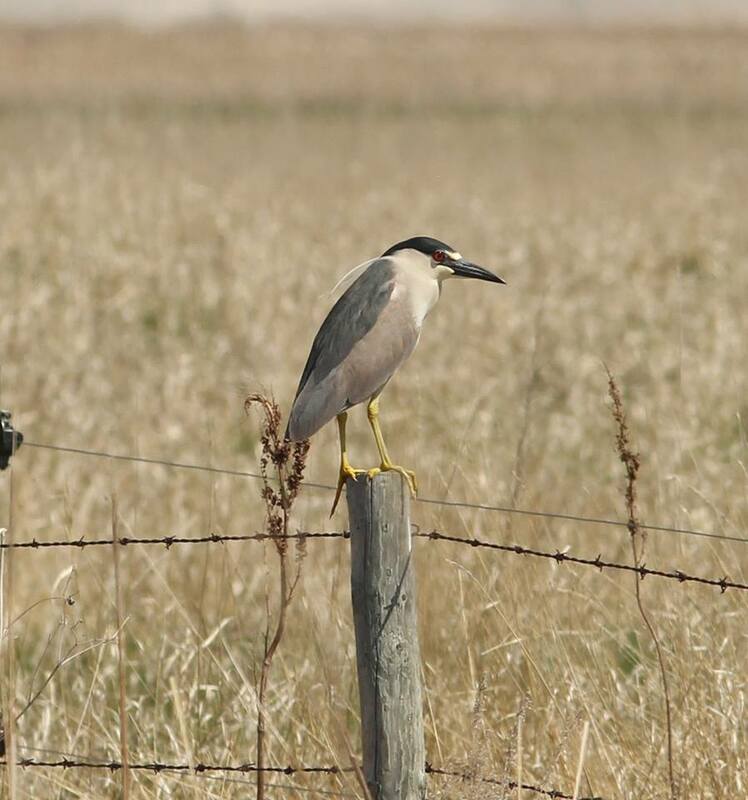 Black-crowned Night Heron – Photo by Donna Martin. Under normal conditions, the lake averages a depth of around two metres. It covers an area of roughly six to ten thousand acres of crown land, which is surrounded by private agricultural land, with some oil drilling development evident along the south shore. The lake has historically been subject to major fluctuations in size and depth. Throughout most of the 1930’s and 1980’s, arid and drought seasons lead it to periodically dry up entirely. Though less common in the past, the lake has also been known to flood into adjacent land during wet seasons, due partly to a lack of any natural outlet for the lake – an issue that has led some to suggest creating an outlet, though this is something of a controversial issue. 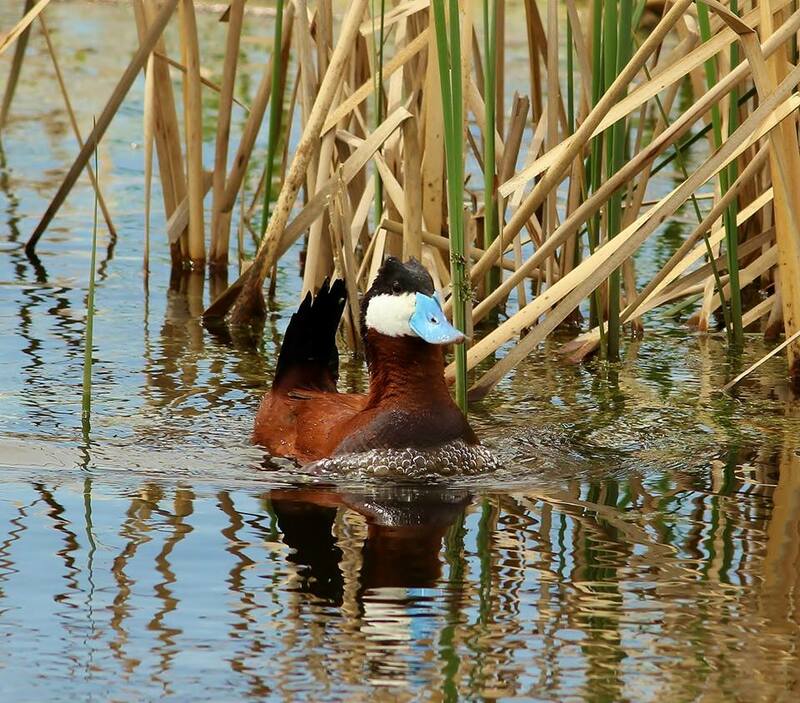 Ruddy Duck – Photo by Donna Martin. Unfortunately, the area has been experiencing high lake levels for about five years, a condition which leads to a poor habitat for shorebirds, and the trend has continued this season. Dykes, which were built by Ducks Unlimited throughout the 1990’s as part of their Habitat Restoration Project with the aim to control lake levels during especially dry or wet years, and which were also used as hiking paths with interpretive signage, have all been breached, leaving little space for viewing. Luckily for us, the area that remained supplied a wide number of species easily viewable from the main drive in. 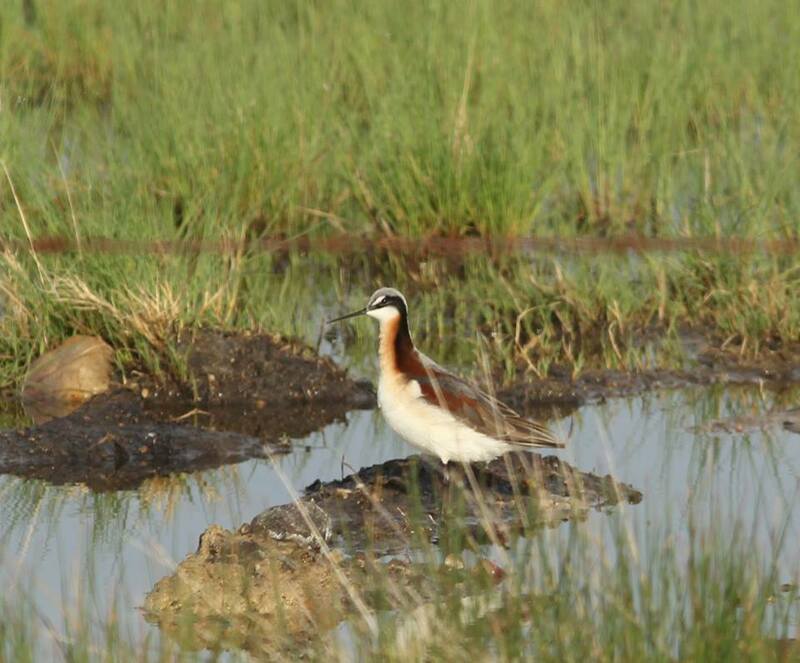 Wilson’s Phalarope – Photo by Donna Martin. After installing signs which labelled the space as an IBA, we checked out the viewing mound, from which we were able to see a large amount of Red-winged and Yellow-headed Blackbirds, as well as Barn Swallows, and the occasional indeterminable duck silhouette in the distance. It was when we moved back along the road we had come in on, surrounded by high water, reeds, and cattails, that we were able to view a wider array of species. A pair of Black-crowned Night-Herons were perched in the tall grass along the water’s edge, and Franklin’s Gulls flew over head, diving into the water to hunt near by – both trigger species for the IBA designation of the site. While the high water made for inopportune conditions for shorebirds, we did see some Kildeer and a Wilson’s Phalarope flitting amongst the reeds. The conditions were favourable for waterfowl, however, and we were able to identify many species – Mallards, Ruddy Ducks, American Coots, Canvasbacks, Canada Geese, Snow Geese, Redheads, Northern Shovelers, and Eared Grebes were all seen. One cormorant was spotted as well. 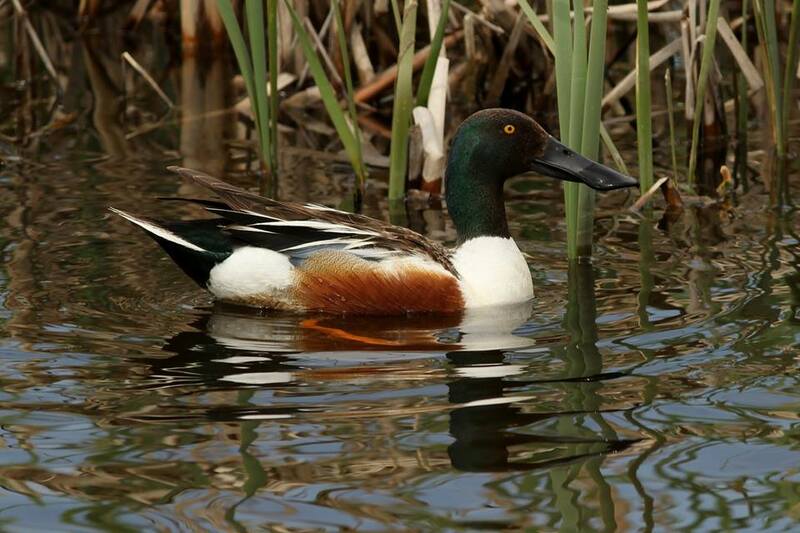 Northern Shoveler – Photo by Donna Martin. Satisfied that we’d gotten a good look at most of what was accessible of the IBA, we headed off for a quick tour of the surrounding area, which provided viewing opportunities of hawks swooping about in the distance, and many more Red-winged Blackbirds. While it was a shame that so much of the IBA had been inundated with high water levels, there was still plenty to see in the areas that remained accessible. One can imagine how impressive the area could be under ideal conditions – certainly a destination that warrants a return trip. On the way back along the Number 2 highway we saw a group of Wild Turkeys too!